We work with you to bring your greatest leadership presence forward, at the crossroads of where your key leadership activities, your clear and connected interactions with your team, and your business outcomes meet. Either through 1-1 coach consultation or as a participant in the Executive Coach Training Series, we work with you to bring a coaching methodology to complex client situations so that your signature presence will support and challenge your clients to greater development and effectiveness. We work with you when you want a consistent internal executive coaching approach installed in your organization, so you can support leaders to face daunting challenges with humane determination. 1)	Leaders and teams speak directly to each other, not about each other. 2)	Leaders lead with both backbone and heart.® They do not leave either one out, and encourage their teams to hold that balance as well. 3)	Leaders use authority as a resource -- they don’t abuse or refuse to use it -- to create committed and coordinated teams to achieve results. 4)	All teams have patterns that are co-created among the members, including the leader. Some are functional and need to be reinforced. Some patterns need to shift to become more effective. Patterns are ingrained and difficult to change. Live team coaching is one of the most productive ways to shift team patterns. Discover how to help leaders commit to and build productive teams (even if they underestimate the effort, skill, and attention that it takes). 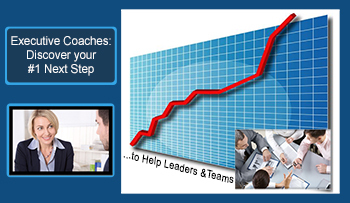 There is no one-size-fits-all answer to coaching executives to lead effective teams, but if you take a moment to tell me about your situation, I can give you the #1 next step to take, designed for you, FREE.